I have some thoughts on the new party healing UI but they’re not fully formed yet, and I was a little too busy to take proper screenshots on the way through, so I’ll return to that another time. 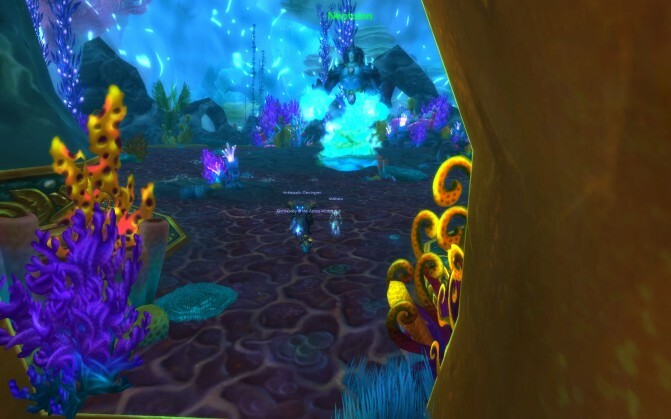 For now, here’s my not-so-quick walkthrough of Throne of the Tides (without many pictures, although I may add them another time). This is a rather long post, but it’s an entire instance and there’s a lot of detail in here. Ctrl-F is your friend! This is based on beta build 12644, it’s all subject to change. I’ll add this to the strategy section once it’s closer to Live. 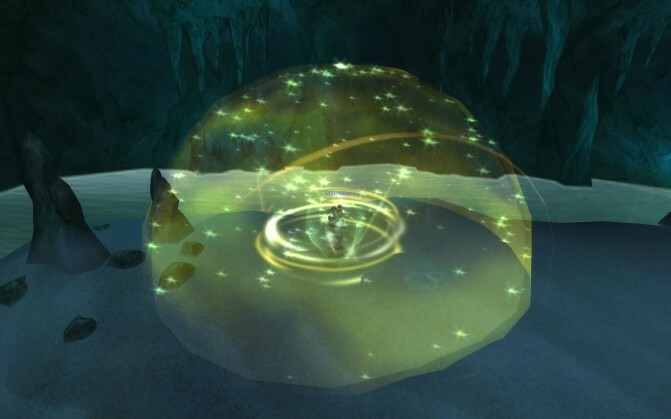 To get to the instance entrance area, just swim down into the Abyssal Maw as deep as you can go, and eventually you will ‘fall through’ the bottom and land in a cave with the instance entrance in it. The layout’s a bit tricky to describe, especially since the game doesn’t yet include maps for the place, but I’ll do my best. 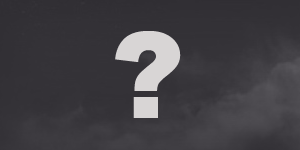 TotT (that’s a messy abbreviation…) essentially has three “wings” over two levels. When you walk in through the front entrance you’ll move forward through the first trash pack, up some stairs, and into a room with three exits. The left and right exits are blocked by wiggling tentacles, belonging to Ozumat, the end boss, who we’ll get to later. So first you need to fight your way forwards to the end. When you reach the end you’ll find a friendly goblin who’ll tell you all about how he’s all set to get this elevator working. Since you’re in a bit of a hurry, ask him instead to teleport you upstairs (I can’t tell if this is an under-development kind of joke, or if we’re laughing at goblin workmanship). Another long hallway to fight through, with Lady Naz’jar at the end. Once you’ve defeated Lady Naz’jar, turn around and go back the way you came. You’ll quickly discover Commander Ulthok has arrived and is inconveniently standing in your way, so dispatch him post-haste. Ask the goblin to teleport you back downstairs again, and head back to the three-way junction. One of the side passages will be filled with purple elementals, that’s the way to Neptulon and the end, so go the other way first, past a lot of smaller Gilgoblin mobs. After a short slog through the trash you’ll come to Erunak Stonespeaker, who’s boss number three. Finally, head back to the centre again and hack and slash your way through the corrupted elementals to Neptulon’s room, and prepare for the final battle. I’ll cover the trash mobs leading to each boss as well as the bosses themselves in each section, since some of the packs need a bit of care. Naz’jar Spiritmender – Will cast Healing Wave a lot, or Wrath otherwise, and need to be kept under control or you will literally not kill anything. If there’s two in a pack, CC one and burn the other with stuns, then either leave the second one or kill it, it’s up to you. These will pretty much be the biggest challenge you’ll face in these packs. Naz’jar Invader – Will melee swing and also apply Lacerate to their target. Lacerate was doing 225 damage per second per stack to the tank I had, but I saw it stack as high as 30 (for 6750 damage per second) on our tank before he died and we wiped. This shouldn’t be a problem as long as the rest of the mobs are going down in a timely fashion though, since you get one stack every 5 seconds. 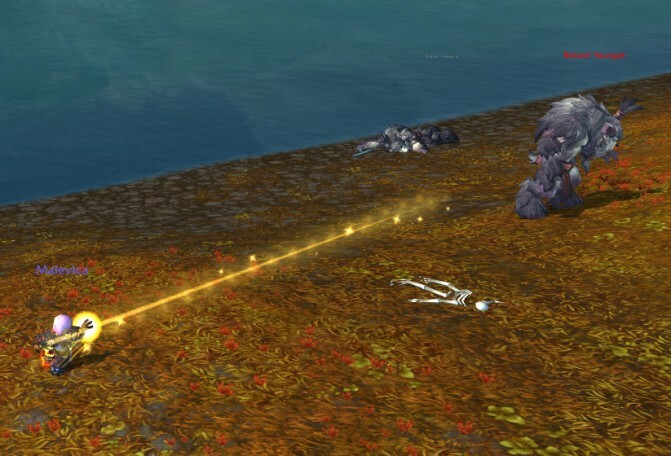 Naz’jar Tempest Witch – These mobs have a Chain Lightning which starts at around 10k for the first hit although it does drop by about 2.5k per jump. Ranged need to be at range and spread out to mitigate the worst of this. Tempest Witches will also cast Lightning Surge on a random player giving them a magic debuff of the same name, which causes the player to explode for around 15k Nature damage after 5 seconds if it’s not dispelled. 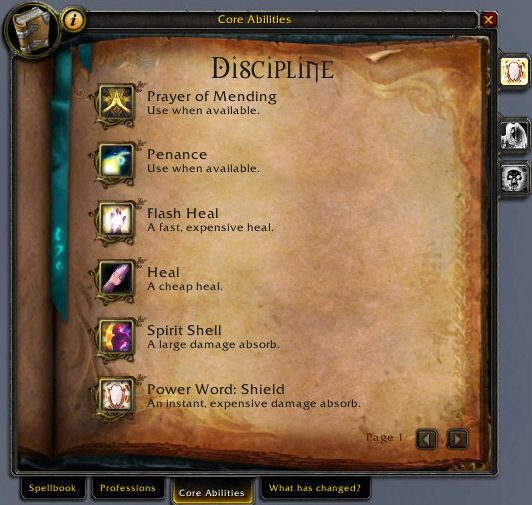 All healing classes can now dispel magic on friendlies, so this needs spotting and dispelling. There are also a couple of lone patrolling Naz’jar Sentinels to watch out for. They hit fairly weakly in melee, but they will cast Noxious Mire on a random player, leaving a patch of green fumes on the floor which lasts 10 seconds and deals 5000 Nature damage per second to anyone inside it. Again, ranged should be spread out and the tank should kite the Sentinel out of any fumes on their location. Lady Naz’jar is an alternating boss/adds type fight. At 66% and 33% she will banish herself by casting Waterspout and spawn three adds, unbanishing after one minute (possibly also once all the adds have died). When fighting Lady Naz’jar herself, there are a few things you’ll need to watch out for. The most dangerous is Fungal Spores, which is a disease cast on a random player causing them to take 10000 Nature damage every 3 seconds for 15 seconds (5 ticks). It’s recast pretty much as soon as it fades, so you’ll spend a lot of time dealing with this. This can be healed through by an attentive healer, or dispelled where available. Besides the disease she will summon a Geyser on a random person. You have a small delay of a second or two before the Geyser deals 30k frost damage to you and knocks you into the air. This is likely to kill you if you’re not fully topped off, and the falling damage can be risky as well, so healers need to be alert for this one. When she casts Waterspout and banishes, she will spawn two Naz’jar Tempest Witches (which we’ve seen before) and one Naz’jar Honor Guard. The Honor Guard will melee fairly weakly initially, but will also use Arc Slash every 6 seconds or so. Arc Slash is a 5-yard frontal cone attack which cannot be dodged, blocked or parried, so this keeps a consistent background level of damage on your tank and the cleave aspect means you need to take some care with positioning. My recommendation is to CC one of the Tempest Witches to keep the dispel requirements manageable (remember that Lightning Surge) and the Chain Lightning under control, and burn them down one at a time before moving on to the Naz’jar Honor Guard. Rinse and repeat, and she should go down easily enough. There is no trash. As you turn around to head back into the rest of the instance, Ulthok will pop up in front of you from the pool on the floor. If you’re careless you may find yourself in combat automatically, but it is possible to avoid this. Ulthok is a more challenging boss in theory, although we discovered on beta that he can be kited and killed solo by a class with slows due to his infrequent casts and the number of places to line-of-sight him. I imagine this will be altered before going Live. 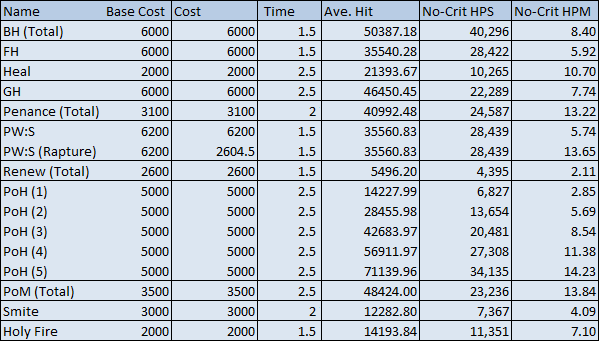 His melee swings on the tank come in at around the 5-6k mark, which is not massive but can add up. Ulthok’s first special ability is Dark Fissure which is a 2 second cast, at the end of which Ulthok smashes the ground in front of his feet, dealing 60k Shadow damage to anyone within 2 yards of the target (i.e. directly in front of him) and leaves a Dark Fissure on the ground (lasting 2 minutes) which deals shadow damage to anyone in it. The tank should move away quickly to avoid being one-shot, and should move Ulthok out of the way so that melee DPS can avoid standing in the resulting Fissure. The other thing Ulthok will do is Squeeze a random player in his hand, stunning them and dealing 5k Shadow damage to them per second for 6 seconds (6 hits). Given that health levels are around 30-35k for most non-tanks it is important to keep players topped off where possible, or to give them some focused healing if they’re low. After heading back to the three-way intersection near the beginning of the instance, there will be two paths to take. Erunak Stonespeaker is along the path which does not have purple elementals on it. (I forget whether it’s east or west, but it’s on the right as you enter the instance). There are three types of trash mobs to deal with here: two types of goblin forming mixed packs, and single Faceless Watchers, some patrolling. Gilgoblin Hunters will attack with Poisoned Spear, which hits for around 15k Nature damage and ticks for around 1k Nature damage per stack. Gilgoblin Aquamages will cast Water Bolt which deals 5k Frost damage and reduces melee, ranged and spell haste by 5% (dispellable, magic). Pulling a pack with more than a couple of hunters is a risky business, because 4x15k from a barrage of Poisoned Spears may make short work of your tank. Be sure you’re at full health and go in with a bubble/CD, or pull with a stun/CC to reduce the numbers to manageable levels (being sure not to get your mage gibbed, of course). The Aquamages have a 2 second cast, but the Hunters have a 0.5s cast, so you’re unlikely to be able to interrupt them easily off the pull. 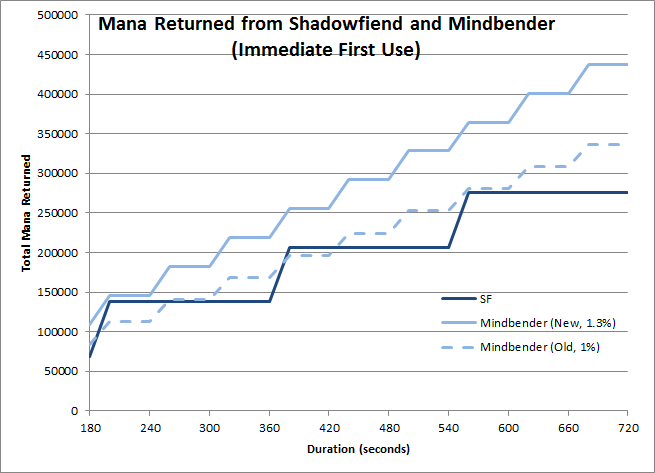 Once the pull is made though, the mobs die fairly easily and their damage is not nearly as focused. The Faceless Watchers are interesting to fight. They will cast Void Rip, lifting everyone up into the air and drawing them inwards, and then after three seconds Void Rip fades and you are all dropped near his feet. He’ll then cast Ground Pound, which makes the ground near his feet rumble and deals 6k Physical damage per 0.5s to anyone inside. The Ground Pound lasts 6 seconds, but you should run out of it before this happens, or you’re likely to not survive. Given that you’ll have a maximum of 30-35k HP on average, you’re looking at 2.5-3s TTL from full health, and probably less since you’ll have just taken falling damage as well. Erunak Stonespeaker is not truly the boss here; he’s actually being controlled by Mindbender Ghur’sha, a sort of ooze/headcrab thing riding on his head. You need to kill Ghur’sha, but it’s pretty stubborn and you need to “persuade” it to let go. When you first pull, you’ll need to take Erunak Stonespeaker to 50% HP, at which point Mindbender Ghur’sha will detach and sit on the floor for a time. Burn it as hard as you can during this vulnerable time, before it picks another target,the highest threat player each time, and leaps onto them. Once again, DPS this target to 50% health (or wait 1 minute, but why would you?) and Ghur’sha will detach again. From here it’s just rinse and repeat until you’ve killed Ghur’sha for good. While you’re fighting Erunak Stonespeaker, he will be doing one of three things besides meleeing your tank. He will randomly cast Lava Bolt on a random player dealing 20k Fire damage and knocking them back, and he will also send Earth Shards towards a random player, which will turn into a patch of spikes when they hit, dealing around 2k physical damage per second to anyone remaining in the area. The big danger in this phase is the Magma Splash, which is a frontal cone Fire attack dealing 20k damage upfront and applying a DoT to anyone afflicted dealing 2k Fire damage per second for 10 seconds unless dispelled (Magic). Once you’ve passed the 50% mark and Ghur’sha is Enslaving players, it will use its own set of abilities rather than the player’s own. The first, and most subtle, is Absorb Magic. This magical debuff (Purgeable) is cast by Ghur’sha on itself, and absorbs all spell damage. What’s more, when damage is absorbed Ghur’sha will be healed for three times the amount absorbed. Purge this one quickly or stop DPS, although currently this doesn’t heal for enough to make much of a difference. The other ability the whole party needs to react to is Mind Fog. A patch of fog will appear around Ghur’sha and remain for 20s, which pacifies anyone inside it and deals 500 Shadow damage per 0.5s. Run out, and ranged DPS might have to be careful of their threat while the tank is pacified. The big damaging ability in this phase is Unrelenting Agony. 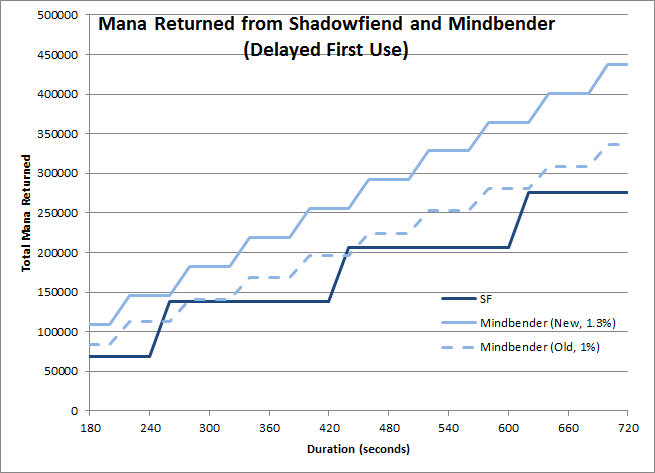 This looks a lot like Mind Flay beams from Ghur’sha to every player, and ticks for around 2k Shadow damage per second for 10s. This needs some preparation to top people off and spread some healing around, although it’s not fatal in and of itself. The trash to Neptulon’s room takes the form of a gauntlet, with the constantly spawning small Unstable Corruption mobs controlled by the large Tainted Sentry elementals. The Unstable Corruptions will spontaneously die, casting Wall of Corruption on nearby players. This is a disease which ticks for 250 Nature/Shadow damage per second per stack, up to a maximum of 20 stacks, with a duration of 8 seconds. The trick to handling these is to ignore them and just proceed to the Tainted Sentries, although if your healer requires time to catch you up (not all healers can remove diseases) then you can build a pause into the progression. 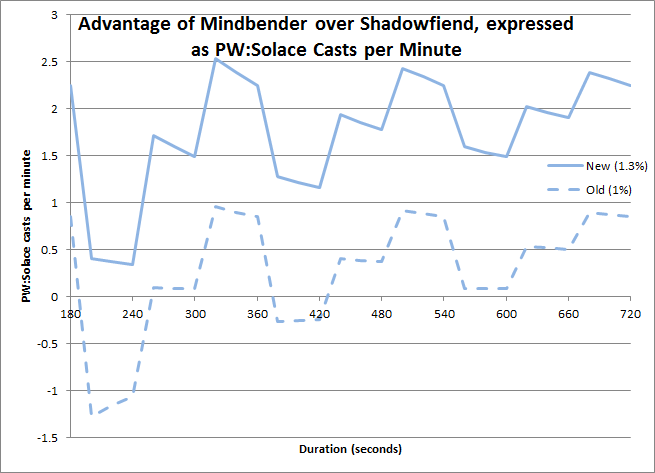 Tainted Sentries are mostly melee mobs, although they have the ability to buff themselves with Swell, causing them to deal 10k Nature/Shadow damage to the party every 3 seconds for 9 seconds. This can be deadly, especially on the last pull when there are two of them or when you’ve got diseases ticking, so it must be purged as quickly as possible. If you have no purge available, try and keep one out of commission while you heal through the other one. To start the fight, talk to Neptulon. You’ll actually be fighting against Ozumat, the leviathan outside the room you’re in, in a three-phase fight. You must keep Neptulon alive for the duration of this fight, or the encounter will reset. Phase one is a bit of a warm-up, where you’ll pick up and kill Deep Murloc Invaders, Vicious Mindlashers and Unyielding Behemoths. The Murlocs are easy enough to deal with through AoE, they only melee swing. Vicious Mindlashers will cast Shadow Bolt on their target for around 5k Shadow damage, and will also curse their target with Veil of Shadow, reducing healing taken by 50%. Their final ability is Brain Spike, which is a 3 second cast that deals 7k Shadow damage to the party and drains 1k mana. This can be nasty, and needs to be the priority for interruping. Vicious Mindlashers should be the kill priority in this phase, burning them one at a time. They do not seem to melee swing, so they do not need a tank staying near them to tank them, which is just as well, as we’ll see. The Unyielding Behemoths do need to be controlled by a tank, and they need to be moved on frequently because they will periodically cast Shadow Blast, where they will leap into the air, hover for 5 seconds, and then slam into the ground dealing 25k Shadow damage and a knockback to anyone close to them. Care also needs to be taken because they will also cast Blight Spray in a 25-yard cone in front of them for 3.5k Shadow damage per second for 4 seconds. Phase 2‘s arrival is heralded by three Faceless Sappers spawning and running in. They will spread out around Neptulon and channel Entangling Grasp on Neptulon, stunning him. These all need to die before Phase 3 can begin. Hindering you in this are the Blight Beasts which are spawned. These definitely do need to be kited around the outside of the room, since they will apply Aura of Dread to anyone within 7 yards of them, dealing 2k Shadow damage and increasing Shadow damage taken by 10% per stack (up to 200 stacks!). There will be multiple Blight Beasts active at any one time, so this can become very deadly very quickly. Current strategy on beta seems to be to have the tank kite the adds while the DPS nuke the Sappers down a.s.a.p. This might not be optimal on Live though, perhaps a melee/ranged split onto Sappers and Beasts respectively might feel more controlled. Throughout this phase, Ozumat will also be throwing black patches of Blight of Ozumat onto the floor, which stack a 200 Shadow damage per second per stack DoT to anyone standing in them. Run out of these quickly. They are a little tricky to spot, since there’s a lot of black shadow around the place, but they are visible if you watch out for them. Phase 3 starts when the Sappers die. The first goal is to clear out the remaining trash mobs as quickly as possible, before turning your attention to Ozumat. Neptulon is now active and will cast Tidal Surge on the whole party, increasing HP, healing and damage massively, as well as your size and run speed. He will also help you to kill Ozumat by chain-casting Pure Water on Ozumat, dealing 100k Frost damage at a time. 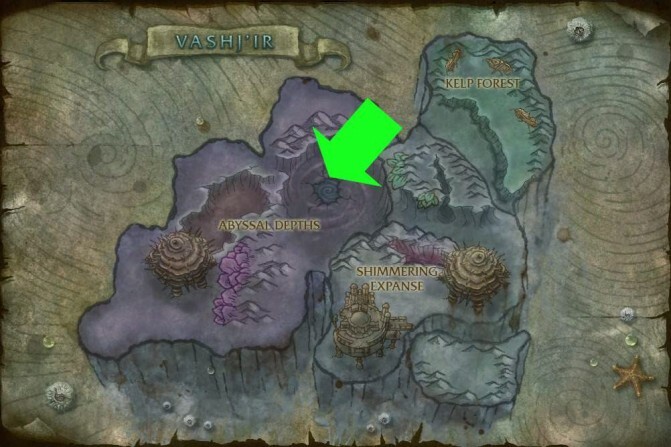 Because Ozumat will be constantly casting Blight of Ozumat, this last phase is a race against time before Neptulon or the raid dies due to the stacking DoT, making it very reminiscent of the end of the Lady Vashj fight, for those with long memories. From a healer’s perspective it’s pretty rough, and will test your triage skills! I have to confess I didn’t get around to much healing on the PTR in the last couple of days, spending most of my time soaking up the scenery and making mouseover macros. I did take myself off to Vashj’ir to do some levelling though. I will try and keep the Cata posts generally more structured than this, but I’ll admit I’m excited enough to throw up a first impressions post early, so here it is. This is based on build 12604, and may already be out of date, although I didn’t see anything in the spell diffs that contradicts what I’ve written here. From the moment I zoned in, standing in the middle of Orgrimmar, I was genuinely impressed with the graphics upgrade the game has been given. The art and design folks have done a great job of updating the models and textures for the buildings and scenery to make them look a bit less 2005 and more 2010. It’s certainly no Aion, but the game world does feel a lot more real than it used to. The most striking difference is the water texture, which is a lot more realistic-looking and less regular, and such a massive difference I feel compelled to add a screenshot. I’m sure everyone’s been poring over the screenshots on MMO-Champion for months, but I haven’t so this is new and exciting to me. Allow me my moment! Here’s a nice change: the combat log finally handles absorbs properly. What you can see in the second log extract is the way the information is handled and reported. First the log shows me casting PW:S on myself (“SPELL_AURA_APPLIED”), and the size of the shield as the third from last number in the list (8615). Then you can see the log reporting that the mob failed to do damage (“SWING_MISSED”) and the reason why (“ABSORB”), and the last number on the line is the amount absorbed (320, 377 and 424). On the next line the Power Word: Shield is refreshed (“SPELL_AURA_REFRESH”) and the third figure from the end tells you how much absorption is left in the shield (6678, 6301 and 5877). And if PW:S fades early, you also get a report in the in-game and text-based combatlogs telling you how much remained unused. 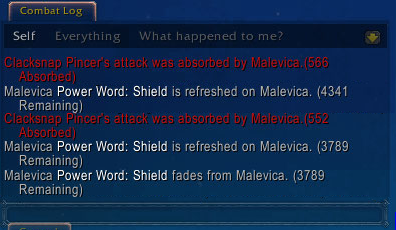 (“SPELL_AURA_REMOVED” or “Malevica Power Word: Shield fades from Malevica. (3789 Remaining)”). For a Disc Priest in particular this is fantastic news. Not only because now we can get correct credit for our contribution (for every situation where a pugger with Recount has shown us doing less healing than the Feral Druid, there’s a situation where WoL has given us credit for every Sacred Shield going, not to mention the fun we had on the Twin Val’kyr for a week or two…) but also because it opens the door for proper estimates of how much absorption is left on a given player. I dream of adding another power bar to each player’s frame with a PW:S indicator analogous to their health bar. It’s a nice thought, anyway. Is just awesome. The absorb amount seems a little low at the moment, especially given the long-ish cooldown (3 minutes), but there’s plenty of time to change this before release if necessary. It’s essentially a holy version of the DK’s Anti-Magic Zone, and it looks like someone froze Holy Nova at it’s fullest extent and made it extra golden and sparkly. I hope this animation stays, because it looks spot on. And it’s very visible too. It’s also nicely sized at around 15 yards from side to side: you do need to group up quite close to stay inside it, but you don’t need to be stacked too tightly to be comfortable, and the edge is pretty well-defined as you can see in the screenshot above. You also get a buff Power Word: Barrierapplied while inside which you could add to Power Auras or similar so it’s easy to see when you’re inside the area of effect. One downside of PW:B is that unlike it’s single-target counterpart it doesn’t appear to report it’s absorb amount remaining in the combatlog. You get a SPELL_CAST_SUCCESS for the spell, and a SPELL_SUMMON when the PW:B is created, and you do get an ABSORB report with a value, but there’s no indication of how much is left, in contrast to how PW:S works. Here’s another combatlog extract for your delectation. This log shows me putting a PW:B down, standing inside it, and letting a Zin’jatar Guardian and Zin’jatar Overseer hit me for a while. Again, I’ve bolded the events and amounts. 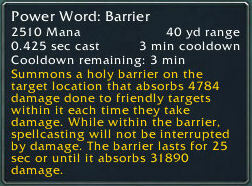 The tooltip says “Absorbs 4784 damage done to friendly targets within it each time they take damage”. This suggests that every hit has 4784 damage taken off it, but in my testing the PW:B lasted 5.3s, and absorbed a total of 3229 damage spread over multiple hits before disappearing, not quite what the tooltip suggests. Perhaps there’s a bug with the numbers, but that top figure seems to be a per-person cap, rather than per hit. The tooltip definitely needs some clarification. I mean, clearly a 32k shield would be massively overpowered while solo, so there ought to be a cap, but 3-4k still seems a bit low to me, compared to 8.6k PW:S casts with effectively no cooldown. The other downside, albeit a situational one since I was mostly levelling in Vashj’ir, was that it was a bit frustrating that PW:B, as a ground-targeted spell, was not especially useful while fighting in three dimensions. Sometimes it’s not convenient to drag mobs down to ground level to cast the spell. Again, I don’t know how I’d solve this problem while still retaining the ease of use. Maybe it’s just one of those things that we’ll have to live with. If you replace it with a more free targeting mechanic like the anti-air guns on some vehicles (Demolishers in Ulduar, I think) then it could be quite clunky to use in raids when you really just want a quick action and you’re (probably) limited to two dimensions anyway. Speaking of tooltips, I was very pleased to see that spell damage/healing amounts on tooltips now update in real time, as well as cast times and mana costs (we only have the latter two in WotLK, as far as I can remember). It won’t replace DrDamage, but it’s a really nice thing to see which should have been there for a while anyway. 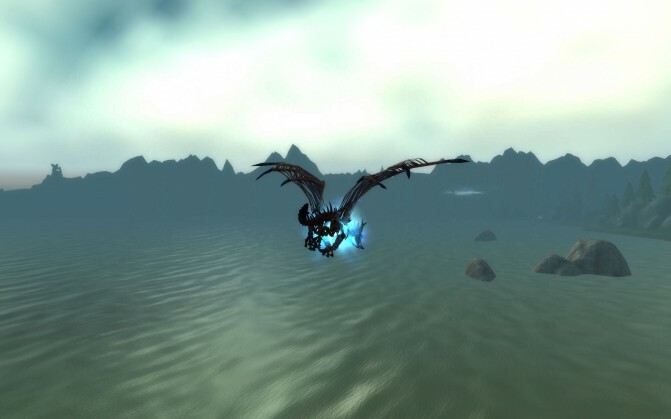 Getting beyond the superficial, as expected there are no addons in use at the moment on the beta realms. I’d forgotten how much fun it was working with the default action bars again after all this time. I did nearly die on more than one occasion because I’m so used to having a HUD and having my player and target frames near the bottom of my screen rather than the top that I wasn’t paying attention to the screen. There’s a big thread up on the beta forums with feedback and requests for the default UI. I doubt I can add anything to that list, although I do think that some of the people commenting in that thread might be missing the point a little. If you want total customisation, I think that probably ought to remain the province of addons, since customisation, especially in GUI form, costs resources. The ability to move the player and target frames around. You can do this with the focus frame, so it would be nice to be able to do this with the other frames. The reasoning is that your eyes tend to be focused on the bars at the bottom of the screen (not all of us are fluent in 20 keybinds) and it’s easy to neglect something hidden away in the top corner. Also thinking of the player and target frames, if you turn on the health bar numerical display it pretty much entirely obscures the green bar behind it, making it tricky to see at a glance roughly how healthy you are. Perhaps this is a bigger problem because it’s compounded with the location of the frames themselves, which means you might only be taking a quick glance rather than having time to look in detail. Some sort of Clique-like interface alongside the key bindings interface. The trouble with this is that Clique steals the right-click which is used to access the menu for things like raid marking, inviting, inspecting, leaving groups and vehicles, etc. I don’t have a good solution to this. Thinking about it, I tend to use VuhDo to target a player and then right-click on the standard target frame to use the menu, although I’m aware that you can set VuhDo up to show the menu directly. I noticed that there’s an option for compact party frames, which I presume are similar to the default raidframes but for a party, but since I didn’t join a party last night I’ll have to wait and see about that one. Likewise, I’ve not seen how buffs and debuffs are handled in party or raid situations, so I have no comments to make on that. The other big change is the vehicle UI, which completely replaces your action bars and makes it very clear you’re in a different type of situation. It’s nice to see this being revamped, rather than just replacing your main bar, although I think the new UI looks a little bit to cartoony at the moment. The health bar being represented by a jar filled with green liquid just doesn’t match any other element of the UI (the party frames just have bars) and looks a bit too cheesy for my money. OK, a slightly frivolous point to finish, but seriously, it felt like more than half the players I was with were Druids, most of them Moonkins. I don’t think I saw another Priest all night. Maybe this is a sign of things to come?